On November 21, 2018 – something special is happening in the UK in the realm of UTM and ATM integration. Operation Zenith, headlined by the UK’s Air Navigation Service Provider (ANSP) NATS and the premier global Unmanned Traffic Management (UTM) System provider, Altitude Angel, Zenith will showcase a view of the future of air traffic management. uAvionix is a proud partner in Zenith, together demonstrating how by using the right technology it’s possible to safely integrate unmanned traffic into controlled airspace and open up the skies to commercial airspace worldwide. The greatest thing about this demonstration is the full integration of a number of technologies to integrate the airspace. Of course, ADS-B is one of those technologies. 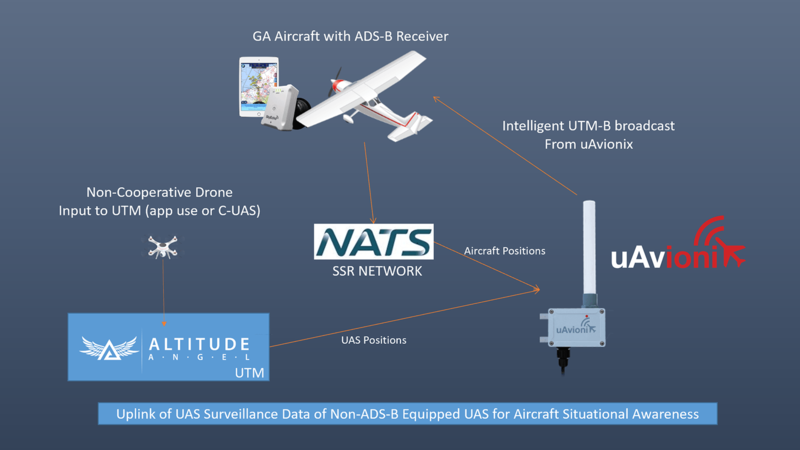 While several of the participants (both manned and unmanned aircraft) will be equipped with uAvionix ADS-B devices – namely Ping1090i for the drones and SkyEcho 2 for the manned aircraft – what we are really excited about is something we are calling UTM-Broadcast (UTM-B). uAvionix’s UTM-B is a derivative of one of the ADS-B services we have in the U.S. called Traffic Information Service – Broadcast (TIS-B). The TIS-B service intelligently broadcasts the aircraft positions of non-ADS-B equipped aircraft to nearby aircraft that have ADS-B receivers. 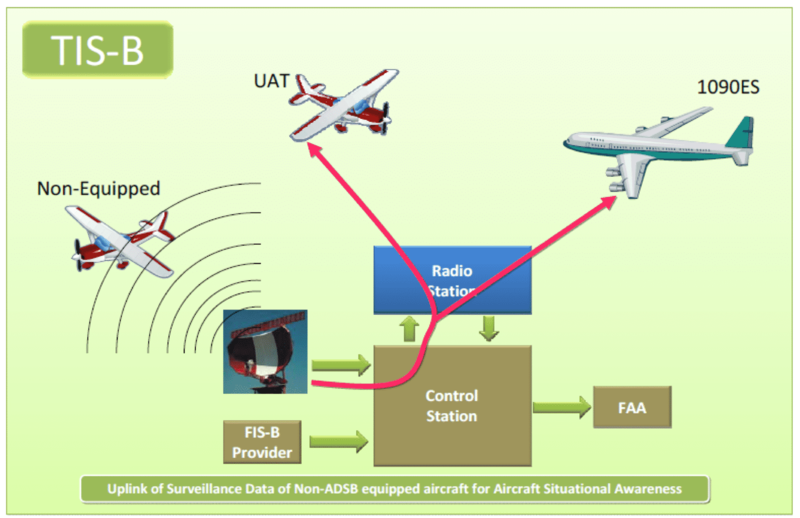 The source of the non-ADS-B aircraft position is the FAA’s Secondary Surveillance Radar (SSR) network. This allows aircraft with ADS-B receivers to visualize non-equipped aircraft on their moving map displays – either directly in their avionics displays or on mobile devices running Electronic Flight Bag (EFB) apps. See the FAA’s graphic below for a description of the TIS-B service. These positions are then intelligently broadcast from a ground station as ADS-B “TIS-B” targets, making them visible to nearby manned aircraft. See below for the depiction of how we are accomplishing this for Operation Zenith. Now – if you’ve been following the topic of ADS-B and drones, you know that spectrum is always an important topic. I’ve described the broadcasts above as “intelligent” because the UTM-B system only broadcasts a drone target if there is a safety situation that requires the manned aircraft to be aware of the UAS. This is an incredibly efficient use of spectrum, and it reduces potential clutter on cockpit and ATC displays as compared to ADS-B equipped drones. uAvionix’s ongoing UAT in the UK project is what enables this important demonstration. As a quick recap – uAvionix operates a network of UAT ADS-B broadcast ground stations in the UK which provide subscription free live ADS-B weather to GA pilots with compatible receivers and displays. 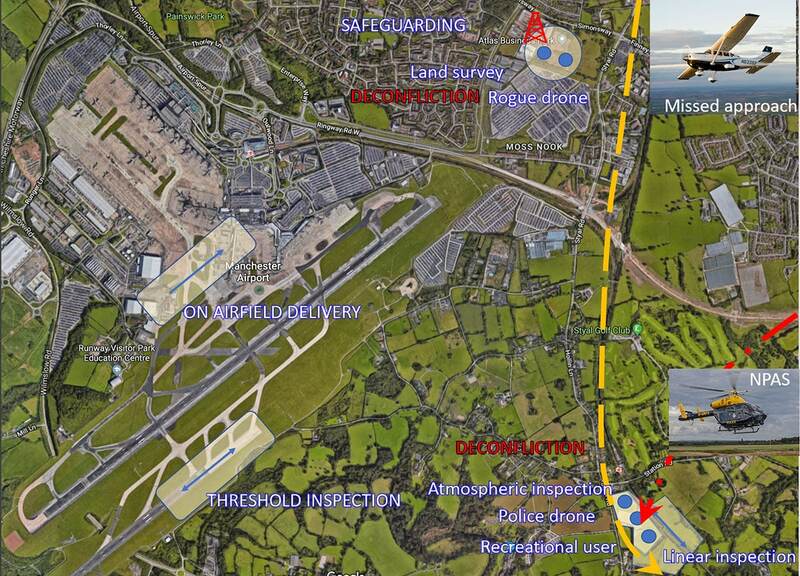 Most of our ground stations are south and west of London, but we’ve stood up a new site at Manchester Airport in support of Operation Zenith. Zenith is the first such demonstration and implementation of UTM-B worldwide. We’ll be improving and expanding upon the concept as we learn more, so stay tuned!